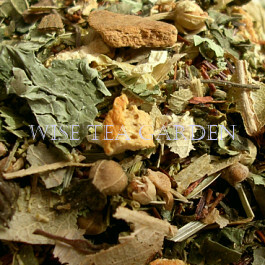 Photography © WISE TEA GARDEN® A few varieties of premium quality herbal blends are in our inventory: Traditional Drinking Herbs, Herb and Fruit Blends to make fragrant herbal tisanes. What is antioxidants? These are disease-fighting compounds that help your body stave off illness. Research has shown that drinking herbal teas may be beneficial in the treatment and prevention of some cancers, heart diseases and stroke. Please do not overdose, and consult with your healthcare professional. What is UHP-AT tea? An Ultra High Polyphenol antioxidant tea has an antioxidant level over 12.5% in comparison with mass-market teas with polyphenol levels between 5.2 and 6.05%. According to results of lab tests at the University of Guelph (Ontario, Canada), Hi^Antiox Citron Green have polyphenol levels of 13.05% by dry weight. Please note: Our Tea products are not intended to diagnose, treat, cure or prevent any disease. We encourages you to consult a health practitioner before consuming herbal products if you have any concerns. *Tip: Consume in small quantities for the first time to check the compatibility of the specific herbal tea with the type of your body. 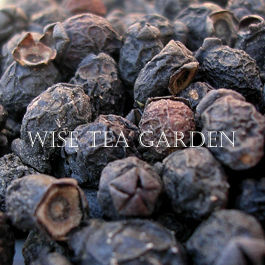 According to modern herbalists, the Elderberry fruits provide relief from pneumonia and improve poor blood circulation. Bilberry is a member of the same plant family as blueberries and cranberries, and there is a believe that its fruits have vision-enhancing properties. Tisanes made from elderberries or bilberries are delicious. With honey or without. Place 2 table spoons of elderberries and 500ml of filtered/distilled water in a small saucepan. Add 1/4 teaspoon turmeric and 1/2 teaspoon cinnamon. When start to boil, reduce heat and simmer for 15 min. Remove from stove and let stand for 5 more min. Strain and pour into mugs. Add honey to taste if necessary. ELDERBERRY TISANE with turmeric and cinnamon. Photography © Wise Tea Garden. Cup Characteristics: A stunning blend of herbs and flowers mixed to provide a sense of overall comfort and well being for the entire body. Life goodness in the a cup. *Drink with care. You may fall asleep if overdosed. Ingredients: Rooibos, Peppermint, Spearmint, Ginger, Apple, Almond, Rosehip pieces, Rose and Hibiscus petals, Osmanthus flowers, Natural Flavours. Infusion: Reddish orange to full colour. Cup Characteristics: Neutral, slightly zesty character, with a hint of fruit at the finish. Bilberry is a member of the same plant family as blueberries and cranberries. To mention, and as you know, France and Turkey are known for growing the finest herbs on the planet. There is a believe that bilberries could help lower cholesterol, reduce inflammation and aid in digestion. 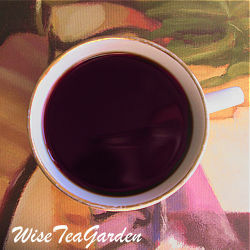 How to brew Bilberry Tea: infuse and steep 1 tablespoon of bilberries in a cup of boiling water about 10-12 min. Strain, add honey to taste. Infusion: Clear with hints of purple. Ingredients: Air Dried Bilberries. Cup Characteristics: According to modern herbalists, elderberries provide relief from inflammation and improve poor blood circulation. Elderberry was named after an ancient Goddess of Vegetation known as Hylde Moer. In ancient times, the Eldeberry tree considered sacred as it was represented the Goddess on earth. Infusion: Deep burnt red. Ingredients: Air Dried Elderberries. Cup Characteristics: Initially the taste is mildly grassy but soon a natural sweetness fills your mouth with a lightly astringent finish. 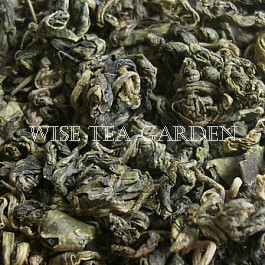 Widely consumed in Southern China for energy and long life. Unlike many herbs that are sour or bitter, Gynostemma has a wonderfully sweet flavor. The extract of the plant is so sweet in fact that it is used as a natural sweetener in Japan. In Asia, Gynostemma is known as a magical grass, it has a wide range of health-promoting benefits » Ingredients: Luxury Premium Gynostemma. Infusion: Dark green. South African herbal teas, Rooibos and Honeybush contribute to the diet with bioactive phytochemicals not commonly found in foods. Major compounds of Honeybush are the xanthones, mangiferin and isomangiferin and the flavanones, eriocitrin, narirutin and hesperidin. 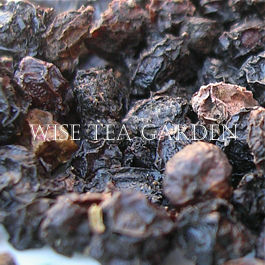 Cup Characteristics: Honeybush tea is caffeine free, high in antioxidants, and has a wonderfully sweet, very slightly astringent flavor with overtones of honey - the overall flavour is very unique and has been compared to hot apricot jam or a dried fruit mix. When brewing the tea, try adding a spoonful of honey to the cup to help open this delicate honey-like character. Ingredients: Organic (Wild) Honeybush. Infusion: Tending orange bright. Cup Characteristics: Sweet lovely hints of cherry and mandarins with smooth fruity finish. During the Middle Ages, the Linden Tree was known as the tree of love. In addition to feeding the flames of passion, Linden was believed to calm the mind and prepare the body for sleep. The plant contains tannins, volatile oils and flavanoids that help to improve circulation. 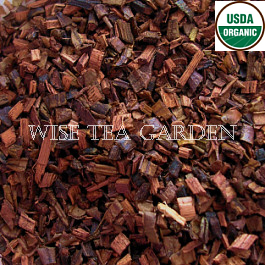 During the WWII, Linden Tea became popular as it also has a mildly tranquilizing effect. Ingredients: Luxury Linden Flowers. Infusion: Tending light coppery green. Cup Characteristics: Fragrant, slightly astringent and warm. For thousands of years, cultures around the world, including Ayurdeda, have believed that sage enhances clarity of both the mind and spirit. The word 'sage' means 'a wise person'. 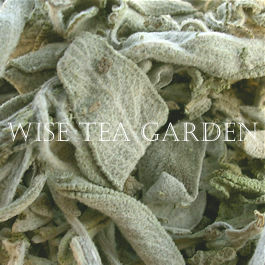 But sage is also prized for its fantastic flavour and is used to enhance everything from meats to pickles and cheeses. 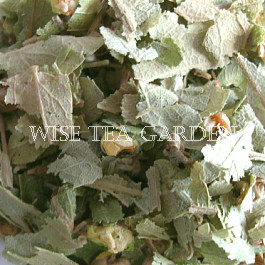 Ingredients: Air dried whole sage leaves. Infusion: Light yellow with hints of green. Sometimes, a simple cup of soothing herbal tea can be very helpful. We are humans and we need to sleep. 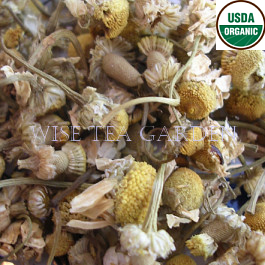 As it is known, camomile is one of herbs to fight insomnia. It also offers a pleasant with honey notes flavour. 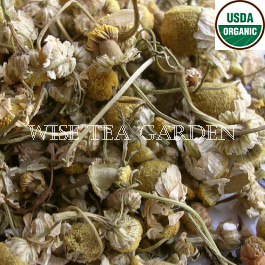 Usually, camomile is served with a splash of lemon to enhance the sweet character of the flower. Cup Characteristics: Mellow and relaxing cup with notes of apple and Egyptian orange. Ingredients: Organic camomile, Organic lemon peel. Infusion: Tending lightly gold colour. Cup Characteristics: Organic Sleepy Mint is a soothing, before-bed beverage: The Camomile will calm you and the Mint will stimulate beautiful dreams. Historically speaking, Camomile, scientifically known as Matricaria and Mint, Mentha, have both long been regarded as health giving herbs. 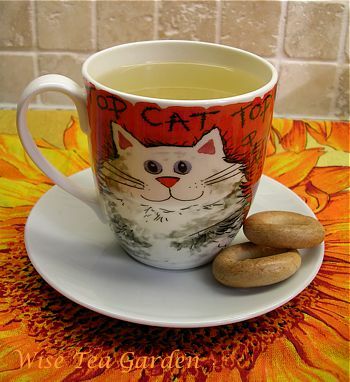 * Milk is not typically not added to camomile tea. 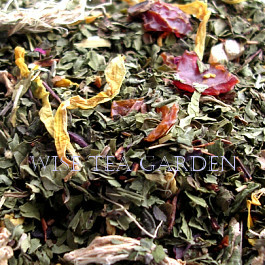 Ingredients: Luxury organic camomile, luxury organic peppermint. Infusion: Pale yellow tending light green. Cup Characteristics: A satisfying and deliciously balanced blend a mellow herbaceous character. Exotic rooibos, anise and cardamom stand out, providing a refreshing and cleansing cup. 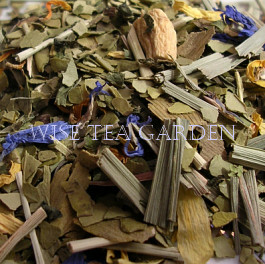 Taken together, these herbs work to restore internal order in the body and make us feel better about ourselves. 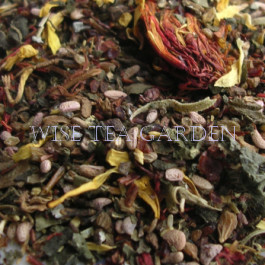 Ingredients: Rosehip, Anise, Raspberry, Nettle, Licorice, Cardamom, Rooibos, Clove, Calendula + Safflower petals. Infusion: Pale burnt sienna with citrine highlights. Cup Characteristics: Soothing and restful, with camomile in abundance. Mild licorice delivers a refreshing light finish. Ingredients: Camomile, Rooibos, Lemon Balm, Lemon Verbena, Linden flowers, Anise, Cinnamon, Oat Straw, Hops, Passion flower, Orange peel. Infusion: Tending light burnt sienna red glistening sunflower yellow highlights.